Apex Access Group offers Rope Access industrial abseiling services for the completion of all building construction and maintenance projects it proves to a perfect alternative for traditional access methods such as scaffolding. Rope Access industrial abseiling is a method of high level access that has been developed over the last 25 years and is used globally in all construction and maintenance sectors. This methodology has an outstanding safety record. the use of industrial abseilers is preferable as an alternative to traditional working at height practises such as scaffolding due to the low set up time, unobtrusive nature and reduced costs. 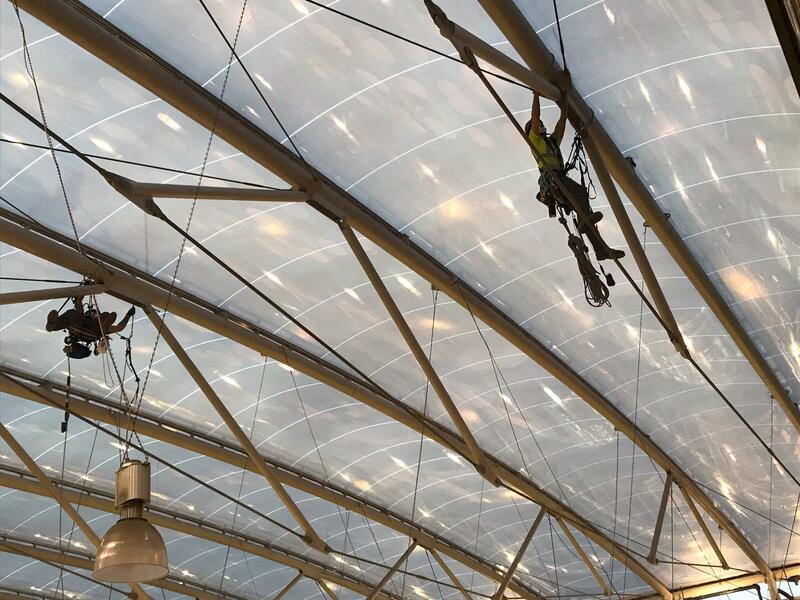 View our services page for an oversight of the type of construction and high level building maintenance projects we have completed with the use of rope access. Industrial abseiling is a very effective access method, specifically for the restoration of light wells due to its quick set up time and unobtrusive nature. Alternative methods of access for the restoration of light wells such as scaffolding would incur much higher costs in the set up time alone which tend to take longer than the project itself. Rope access for internal light well restorations would include works such as traditional wooden sash window restoration, Masonry painting, duct work installation or repairs and industrial chimney inspections and maintenance. Confined space is also another specific industrial abseiling service that we can offer, this may be a silo cleaning and inspection project, Internal extraction ductwork cleaning and dry riser works. Rope access utilised in confined space situation ensures an extremely high level of safety in a high risk situation with the use of rigging to rescue egress systems. Every industrial abseiling project we oversee starts with a specific risk assessment and method statement. Apex Access Group only use Rope Access Technicians trained to IRATA (industrial rope access trade association ) standard. IRATA is recognised as the world’s leading authority in high level industrial abseiling. For projects requiring specific qualifications such as confined space works Apex Access Sources the IRATA trained technicians with the relevant qualifications and experience. Apex Access Group are based in the East Midlands between Sheffield, Derby and Manchester but work nationwide and offer a free quoting services across the UK.